Jonathon Frioux’s studio wall at Captain Captain. A fellow painter first introduced me to Jonathan Frioux on Instagram. His collage and mixed media approaches to painting are fresh and intriguing, so I decided to follow him. I indulged in small-format square photos of his works until just recently, when he posted a flyer for an open studio night on November 8th at Captain and Captain Studios. After my months of stealth following and commenting on his photos here and there, I had the chance to see the work, and the artist, in person. Captain and Captain studios is located in what appears to be a forgotten industrial district more commonly referred to as “granary row.” Walking in, I was greeted with a long hallway of what seem to be older office cubicles turned artist studios. The air was musty and its fragrance was comprised of seasoned wood, industrial dust and mildew. Housed under this roof are eight artists: Frioux, Steven Larson, Chase McCleary, Anne Fudyma, Trent Call, Stephanie Leitch, Jean Richardson, and Trent Alvey. Walking by the doors on a mission to track down the mythic artist, I was confronted with western landscapes, abstract paintings, photography and sculpture, most available in local galleries. Weaving through the congestion of local artnauts, I found Frioux, last door on the left. Dressed in a designer-esque gray and black getup, his longish dirty blond hair slightly disheveled, he leaned on his center table among some of his prints, answering questions from his public with confidence and poise. I took the opportunity to look at the work. 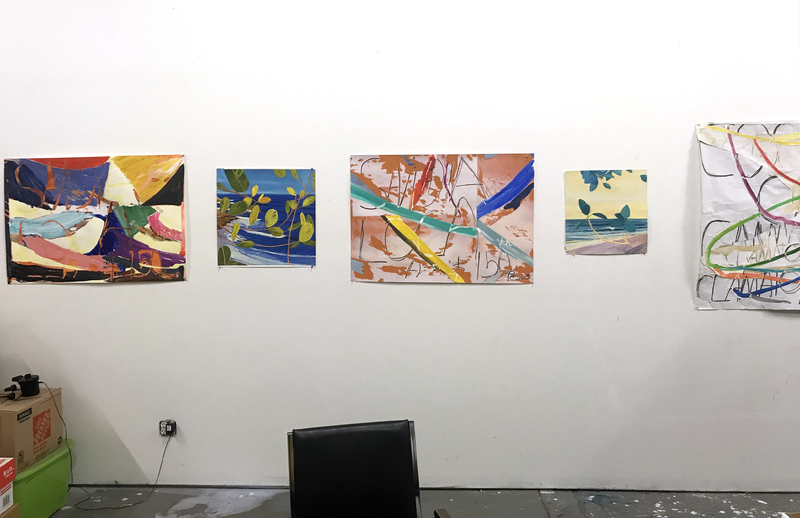 Always seeing images of work on a small screen messes with your sense of size: the paintings and collage-based works varied in size from 22” x 36” to up to 6’ x 4’ in scale, but most were smaller than I had imagined them. Not that this is a bad thing but I suppose in my head I built up these works into something larger because of my own hierarchal sense of their value. After the crowd left, I introduced myself as a current MFA painting candidate at the University of Utah and expressed my interest in his works. What ensued was a casual conversation on the works and how he created them. 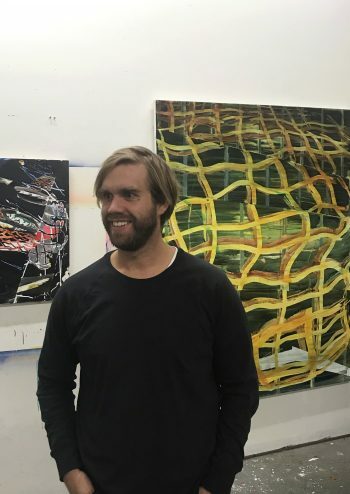 Frioux graduated from Brigham Young University with his Bachelors of Fine Arts in 2011 and received his MFA from Rhode Island School of Design in 2013. Though he is originally from the west coast, and his surfing heritage and coastline language is easy going and direct, don’t be mistaken: he is articulate and educated in the way his works emphasize his concept. He uses his hands quite effectively, similar to a conductor during an adagio, while explaining the process behind the works. His collage works are hand cut bits and pieces of paintings, utilizing both a reductive method as well as an additive one. His paintings are expressive, utilizing bright colors, language and iconography with collage assemblages and blocked out color fields. 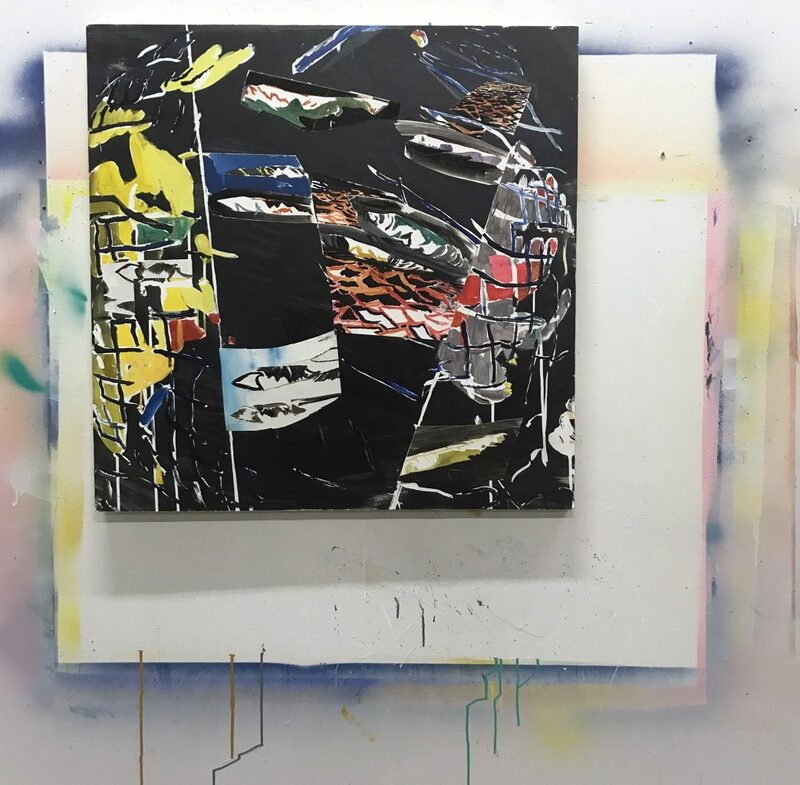 In his works, garbage exists amongst palm trees, pico de Gallo, seagulls, and vacation scenes, and the net is a recurring motif. 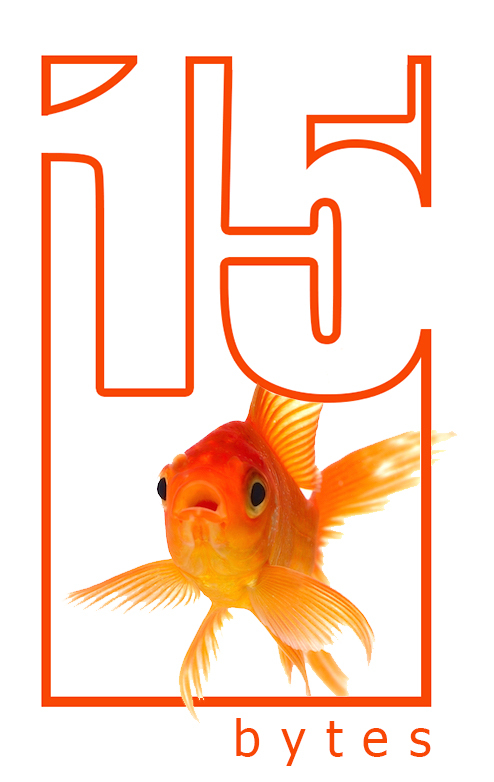 The interconnectivity of the net is symbolic of the global crisis associated with the oceanic wilderness. While conservation is at the heart of these, the pieces, without question, all have coherent signs of connectivity, not only in concept but also in the methods of construction, color choices and reoccurring symbols. Ultimately the work operates in the balance between conservation and destruction or the decaying ecology surrounding the global coastlines. With the opportunity to see the works in person, I dive in for a closer look at one in particular: “Pull apart the continents and you get SWELL.” A roughly 36”x36” square painting , it is sectioned into 4 asymmetrical cells running across the canvas. In contrast to Frioux’s high intensity yellows, greens, blues and reds, the palette is mostly dark. Wavelike forms exist in what appear to be painted collage sections dispersed on the canvas. The outermost 2 quadrants, on the left and the right, house a decayed netlike structure consisting of yellows greens and blues with hard white negative space separating the lines. On the right, a Prussian blue net is overlaid on a desaturated gray form existing among cadmium reds and bright pinks with ocean-blue highlights. The two quadrants in the center of the piece echo collage by the visual means of a tear-like vertical connection. Underneath the floating cropped abstracts of nets and wavelike forms seems to be dark Prussian blues commingled with blacks and dark grays emulating a deep ocean. Contained within the painting as a whole is evidence of superior masking and paint control—the sections and paints are never muddied or allowed to naturally mix. Controlled sections exist with torn like white negative space apparent of clean white gesso echoing the collage like painting style Frioux utilizes so readily. The title of the piece creates points the conversation to the global ocean: “Pull apart the continents and you get Swell.” I read the two outside quadrants with the net like structures as both nets and potential references to the global sphere. Similarly, when you pull on anything it can have a tendency to tear, which is apparent in the center quadrants, which have the appearance of torn paper. The cropped sections of abstract forms and additional nets can be read as objects and potential trash or garbage flowing in the swells of oceans. It’s a painting you can get lost in. Maybe even trapped in. Coming up for air, I thank Frioux for his time. We shake hands and smile, and before I leave he asks: “Do you like food? I’m a great cook, we should have a collage night soon.” I plan on taking him up on it. Nothing better than a night in the studio, especially with an artist I look up to. Much better than stalking them on Instagram. Nolan Patrick Flynn is a teaching assistant and M.F.A. candidate at the University of Utah.